Small 7" Snout Diameter - Miniature Poodles, Shelties, Bichon Frises, Miniature Schnauzers, Yorkies. Medium 9.5" Snout Diameter - Fox Terriers, Beagles, Lhasa Apsos, Keeshonds, Whippets, Westies. Intermediate 11.5" Snout Diameter - Cocker Spaniels, Boston Terriers, Bull Terriers, Border Collies. Large 13" Snout Diameter - Huskies, Labrador Retrievers, Golden Retrievers, Setters, Dobermans. X-Large 14.5" Snout Diameter - Great Danes, Newfoundlands, Great Pyrenees, Bernards, Bull Mastiffs. Made of Cordura nylon with breathable mesh front. 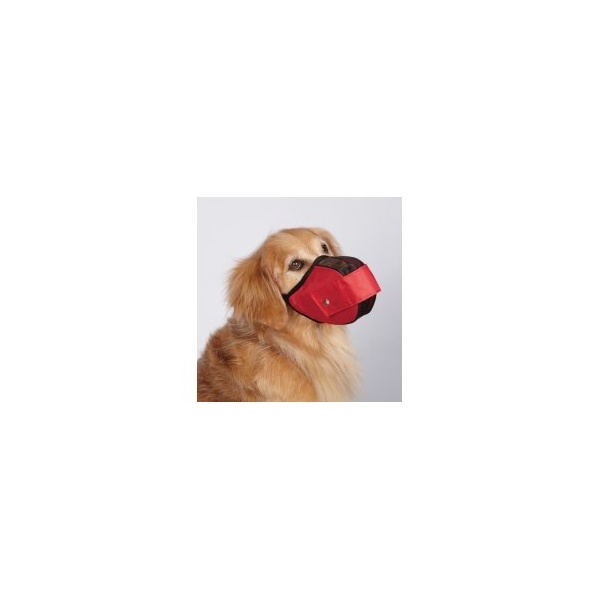 This comfortable muzzle features a unique snap strap that allows well-behaved pets to eat and drink with the dog muzzle on, giving dogs the ability to eat, drink and breathe easily while restricting unwanted behavior. 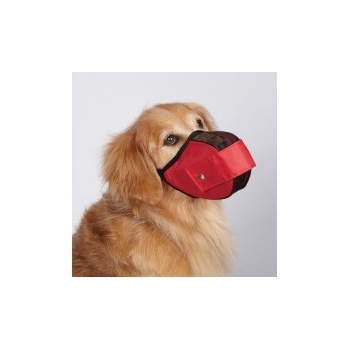 The dog muzzle slips on quickly, snaps closed, and has an adjustable, woven nylon strap. Tough, washable cordura nylon resists tears and punctures, yet feels comfortable to the dog.